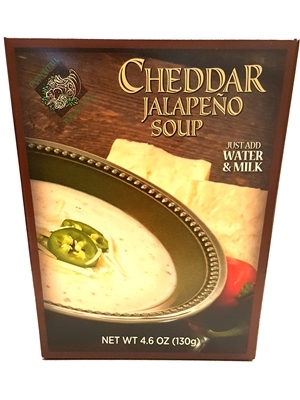 Creamy, cheesy, soup with slight zing of jalapeno peppers. While the peppers add spice, the cheesy flavor plays it down so there's just a little heat. But oh what flavor! It cooks in as little as 10 minutes but tastes like you worked all day. In a large sauce pan over medium heat, whisk together ingredients; bring to a boil, stirring constantly. Reduce heat and simmer uncovered for 10 minutes, stirring often to prevent sticking. Cheddar and blue cheese blend[whey, cheddar cheese, (pasteurized milk, cheese cultures, salt, and enzymes), butter, buttermilk, sodium phosphate, natural flavors, lactic acid, disodium phosphate], corn starch, rendered chicken fat, dehydrated onion and bell pepper, hydrolyzed corn protein, yeast extract, natural butter flavor, (whey, butter oil, corn syrup solids, salt, guar gum, annatto and tumeric), sea salt, jalapeno powder, silicon dioxide (anti-caking), xanthan gum, spices, and citric acid.